"COOK JAPAN PROJECT", a 10-Months Unprecedented Gastronomic Event Featuring Star Chefs around the World Will Start from April 2019 in Tokyo! TOKYO--(BUSINESS WIRE)--Granada Co., Ltd. (Location: 1-9-6 Shintomi, Chuo-ku, Tokyo, CEO Yuji Shimoyama) invites about 30 star chefs from around the world to Tokyo and opens a limited-restaurant called “COOK JAPAN PROJECT". It will be held from April 2019 to January 2020 and approximately 30 star chefs from Europe, Latin America, U.S.A., and Asia will come to Japan in turn. About 3 chefs come to Tokyo each month and each chef offers an original course using the best Japanese ingredients. Now the reservation for the 3 chefs’ events in April are available from February 18th 2019. COOK JAPAN PROJECT offers a membership service to those who support the project. Membership customers will have access to advance reservation system. Membership customers will be able to make reservation three days prior (72 hours) to the general reservation at each chef’s event. The opening chef of this historical event is Chef Yannick Allenó, who is the only person to hold two Michelin 3-star restaurants in France. He is a master of modern French and is also an recognized international chef who developed restaurants in five countries, including Morocco, Dubai, Hong Kong, Korea and China. In recent years, he holds a patent technique called "Extraction" that extracts pure taste and mineral of the ingredients, and is pursuing research on "fermentation" as a way to express terroir. The cuisine of this grand master does not stop evolving. 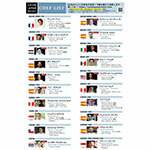 The second chef of "COOK JAPAN PROJECT" is Chef Thibault Sombardier, who has experience working under Chef Yannick Allenó. He is the chef of “Antoine,” Michelin 1 star restaurant famous for its fish and seafood dishes. Chef Thibault’s gifted hands will create delicate dishes using best Japanese ingredients. Jacob Yan Boerma, owner chef of “De Leest”, a Michelin 3 star restaurant in Netherlands . He is a master of aromatic cuisine who has been exploring the taste and fragrance of various ingredients. He creates artistic dishes with a fine tuning of acidity, spices and fresh vegetables. Beverages: Wine / alcohol pairing selected by the chef in accordance with the degustación course will be available at ¥ 20,000 per person (excluding tax). Wine /alcohol pairing will be 10% OFF if ordered on our website in advance. Various wines and drinks will be also available on site. CONCEPT of "COOK JAPAN PROJECT"
"COOK JAPAN PROJECT" , as shown in its title., is a project in which the world renowned chefs create new dishes using Japanese ingredients. The chefs with highest level of skills from around the world come to Japan for only a couple of days and meet seasonal ingredients in Japan, and create an original course using their techniques. It is a unique gastronomic experience, which will be only available on that particular moment at that particular place.